Enjoy a clean, stress-free and organize working environment without having paper scattered all over the place. 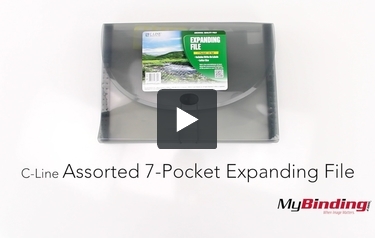 The 7-Pocket Expanding File is the solution for you to store, organize, present, repair, display and protect everything you need. The file contains archival quality polypropylene material, which means the print won't stick to the sheet protector and damage the document. It features 7 individual pockets with 6 fully reusable tabs, perfect for organizing multiple projects or presentations. Top loading, stand-up design provides on the go easy access. The expanding file features an elastic closure for documents up to 8 1/2 x 11". The C-Line product line offers a selection of specialty holders and accessories to keep everything from a desk to a warehouse organized and efficient.